A great band does more than make music—it makes a difference! 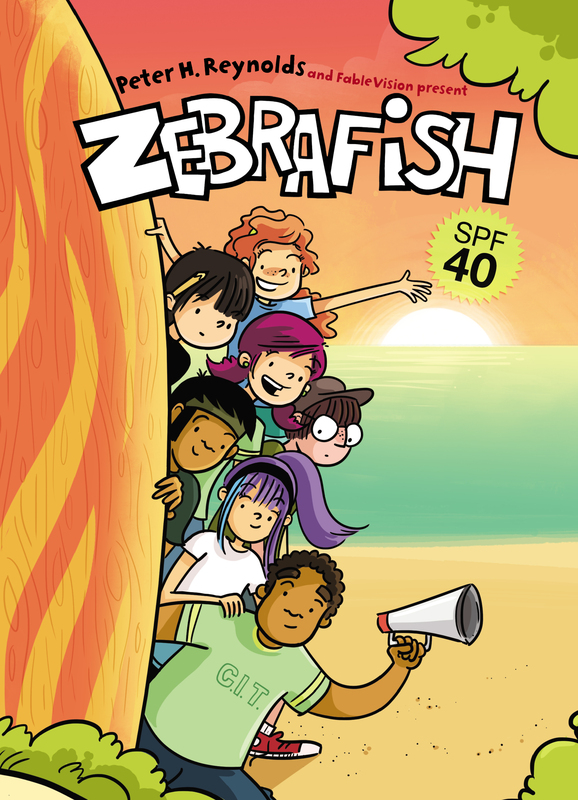 This Zebrafish adventure shows that doing good can make a splash and be a rockin’ good time. Zebrafish has disbanded, at least for the summer, but the ex-band members can still improve the world in their own way. Vita is figuring out how to channel her lazy summer into something positive (with her dog Chimp’s help, of course). Walt and Jay convert an old ice cream truck into an awesomely painted (and fully wired) book mobile. And Plinko and Tanya inspire their campers at Stickleback Arts Camp to seize the day—Tanya takes a special interest in a camper with diabetes who’d rather hang out in the infirmary than participate in camp, while Plinko is preoccupied with his night vision goggles (leading campers to the bathroom night or day!). Ideally Zebrafish will reunite for the end of summer Strings of Fury concert at the Dunes, but there’s a hitch—Vita refuses to play plastic. This follow-up collaboration between FableVision and Children’s Hospital Boston is as rockin’ as the first. FableVision is an award-winning children’s media developer and book packager founded by Peter and Paul Reynolds.